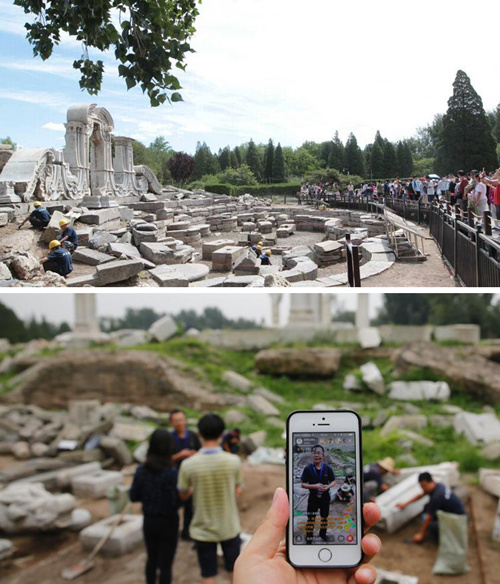 People are examining the excavation of Xiyang Lou, a Western-style building in Yuanmingyuan Imperial Garden, which is Beijing’s first site for public archaeology. More than 100,000 people watched the online live stream. Wang Tao is a professor of archaeology at Capital Normal University. Ten years ago, his academic work mainly consisted of lecturing, excavating sites and writing theses. Today, he also gives public lectures on archaeological information at forums and promotional activities as the head of the university’s Public Archaeology Center. Wang’s experience mirrors the recent boom of China’s public archaeology. However, most workers in this field are motivated by personal interest and passion in the absence of strategic planning and supporting policies. At this point, promoting the healthy development of public archaeology is a common issue for people like Wang to consider. Though it has grown vigorously, there have been disputes over fundamental issues of public archaeology in China, such as whether we can conduct studies on it and whether we should consider it a discipline. Also, it falls short in terms of academic systems and theoretical support. Public archaeology has been an independent research field for a long time in such countries as Britain and the United States. China should accelerate the construction of public archaeology while continuing relevant projects, Wang argued. “Public archaeology is far more than just archaeology. It also deals with politics, economics, tourism and heritage,” Wang said. The prerequisite for the development of public archaeology is public awareness that archaeology is a form of science instead of a hobby. The dissemination of public archaeology should focus on precision and scientific method while appealing to the public’s curiosity, Wang suggested. University general education is an important component of archaeological education, which is crucial to practicing and researching public archaeology. When teaching students who do not major in archaeology, it is necessary to combine professionalism with knowledge, entertainment and interesting anecdotes, said Gao Menghe, a professor from the Department of Archaeology and Museology at Fudan University, at the recent fifth Forum for Public Archaeology in China. “I participated in public archaeological activities out of personal interest. It takes a large amount of my free time but does little to improve my academic performance evaluation in the university because it rarely produces research achievements,” Wang said. Though many universities and research institutes have set up special departments, public archaeology currently lacks supporting mechanisms in terms of manpower and funds, said Liu Zhiyan, the director of the Center for Public Archaeology at the Sichuan Provincial Cultural Relics and Archaeology Research Institute. The development of public archaeology requires theoretical guidance, Liu said, adding that most work is done by individuals while there is a lack of united planning and coordination, limiting the reach of public archeology within society. Wang suggested making mechanisms for public archaeology, such as encouraging archaeologists to share research findings with the public, getting universities involved and promoting general education. Many public archaeological activities are still only promoted within the field, limiting their external impact. Greater outreach is needed to appeal to people from all walks of life, Liu said. Indeed, public archaeology helps groups like students from middle and primary schools to understand archaeology and cultural heritage. However, it aims to disseminate archaeological information to all people based on their educational background and social roles. For example, government officials should be important participants in public archaeology because they are policymakers. These officials will forge more scientific strategies if they can better understand cultural relics and raise their awareness of cultural heritage protection, Wang added. Liu’s institute openly recruited volunteers to participate in the excavation of the sunken treasure of Zhang Xianzhong, an ancient rebel leader, including a variety of archaeological field studies. Public archaeological activities of this kind enable interaction between members of society and archaeologists, making archaeological work more accessible to the public, Liu said. The Beijing Municipal Institute for Cultural Heritage recently chose Xiyang Lou, a Western-style building in Yuanmingyuan, or the Old Summer Palace, as the city’s first site for public archaeology. The excavation site was opened to allow the public to closely examine the whole process. More than 100,000 people watched the online live stream. With the advent of the Internet Plus era and the development of virtual and augmented reality, experts have suggested adopting these technologies to make public archaeological activities more diverse and vivid.